Singer Fille has faced endless problems ever since breaking up with bonkmate and manager Mc Kats. Forget the Nutty Neithan saga, what we can reveal is that there has been an impersonator inform of Filles' manager and has stolen millions from people. A one Kintu Umar conned 2M from Waswa, a Dubai promoter for a show scheduled on the 20th this month. Following Kats firing as Fille's manager, this young money hunter, Kintu Umar, took advantage and wore the shoes. 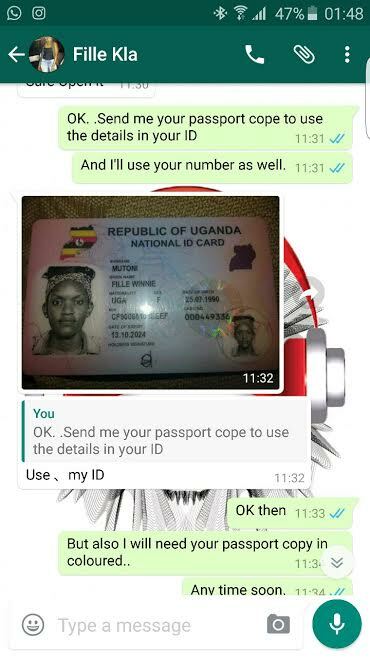 Below is a conversation between Umar and Dubai promoter Waswa. Umar asking for singer's credentials . Fille learnt about this and reported the situation to Najera police station. Police have taken charge and will hunt down this impersonator.